Custom reports enable you to drill-down into specific API metrics and view the exact data that you want to see. From the API Monitoring dashboards, you can create a custom report with the filter and metrics preset based on the configured conditions at time of creation. In addition, a set of default dimensions and metrics are configured in the report for you. Quickly create custom reports based on your context as summarized in the following table. On the Custom Reports page, custom reports that are created using API Monitoring are named uniquely (by default), as indicated in the table; you can change the name when editing the custom report. 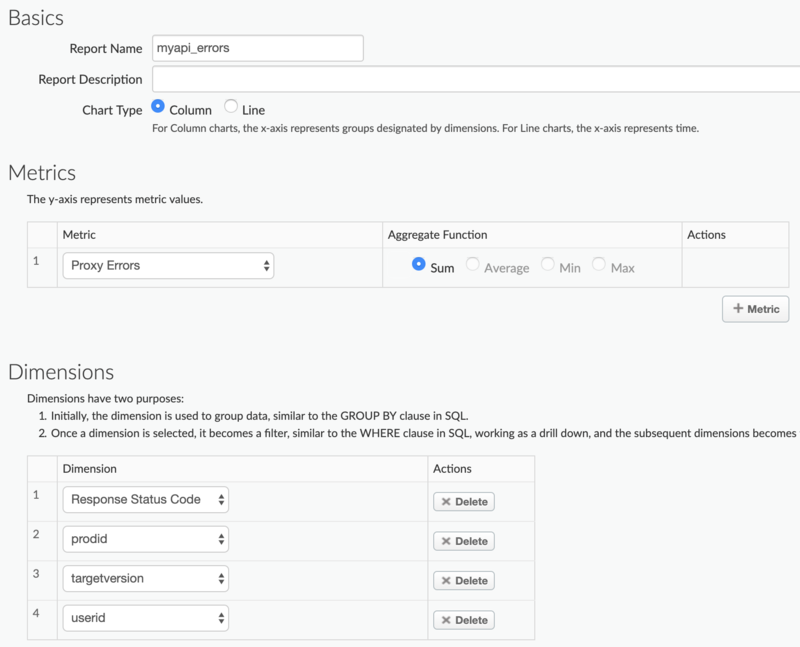 The custom report will include the dimensions and metrics listed in the following table for all API Monitoring generated reports, by default. 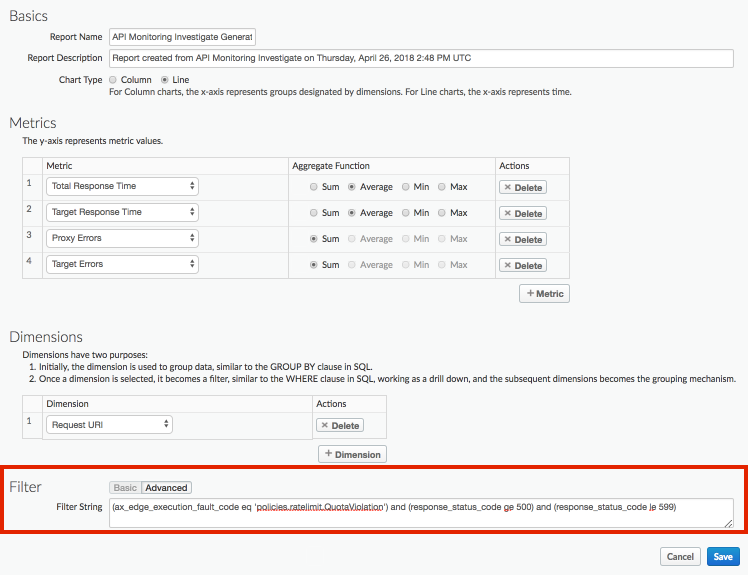 As mentioned in the previous section, a predefined set of API Monitoring default dimensions and metrics are preconfigured in custom reports. After it is created, you can edit the custom report to add or delete metrics and dimensions, as required. For example, you might want to narrow your investigation to a particular access token, developer app, API proxy, or request ID. For more information on all predefined dimensions and metrics that you can add to a report, see Analytics metrics, dimensions, and filters reference. For complete details about how to edit a custom report, see Manage custom reports. Attach the Statistics Collector policy to your API proxies to collect custom metrics for data in a message, such as user or product ID, price, REST action, target version, target URL, and message length. The data can come from flow variables predefined by Apigee, request headers, query params, or custom variables that you define. For more information about the flow variables, see Request message variables. Generate a custom report that includes the values of these custom metrics as a Dimension.